The circuit below has two inputs and one output. Whenever at least one of the inputs is low, the corresponding PMOS transistor will be conducting while the NMOS transistor will be closed. Consequently, the output voltage will be high. Conversely, if both inputs are high, then both PMOS transistors at the top will be open circuits and both NMOS transistors will be conducting. Hence, the output voltage is low. The function of this gate can be summarized by the table. If logical 1's are associated with high voltages then the function of this gate is called NAND for negated AND. Again, there is never a conducting path from the supply voltage to ground. Circuit below shows the TTL implementation of NAND gate. Here, R1 and R2 are the pull-up resistors. VCC is the power supply. T1 is the bipolar junction transistor operated in totem pole configuration. T2 is the normal transistor. The Boolean expression for three input NAND gate and The truth table of the three input NAND gate is also shown in figure. The Boolean expression for four input NAND gate and the truth table of the four input NAND gate is also shown in figure. The NAND is also known as universal gate. 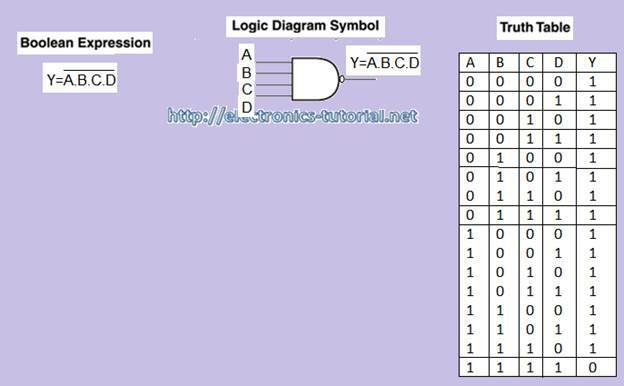 Because by using only NAND gate any kind of Boolean logic gate can be implemented. 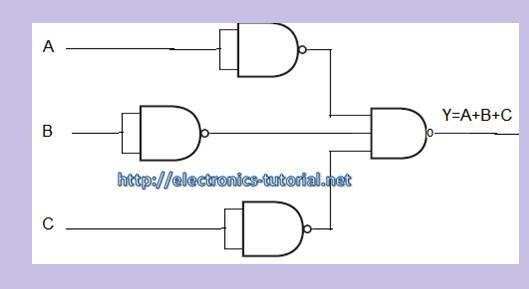 By using NAND gate we can easily implement the AND gate, OR gate and the NOT gate. Implementation of NOT gate using NAND gate. Figure below shows the implementation of the NOT gate using NAND gate. By shorting the two inputs of the NAND gate together the NOT gate can be implemented. Implementation of AND gate using NAND gate. 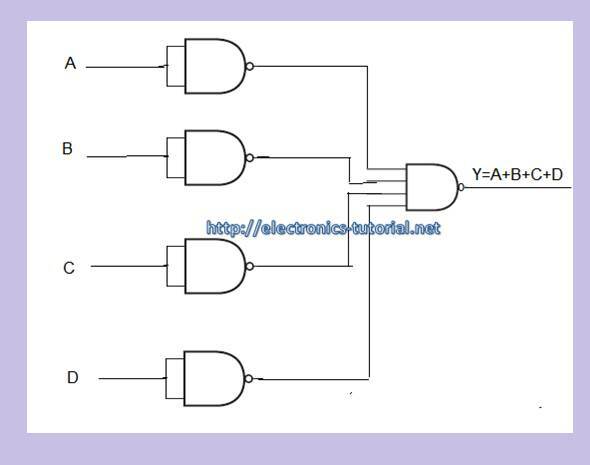 Figure below shows the implementation of the AND gate using NAND gate. Here, by shorting the two inputs of the NAND gate together the NOT gate can be implemented. This implemented NAND when we will connect to the output of the NAND gate the AND gate will be implemented. 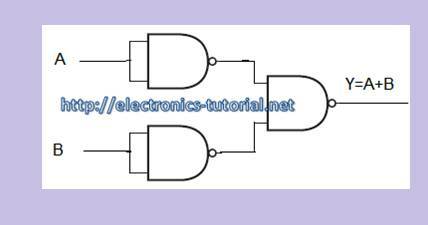 Implementation of OR gate using NAND gate. Figure below shows the implementation of the OR gate using NAND gate. Here, by shorting the two inputs of the NAND gate together the NOT gate can be implemented. This implemented NAND when we will connect to the inputs of the NAND gate the OR gate will be implemented.